Amongst the many old adages relating to the stock market is the one saying "no one rings a bell at the top of the market". And like many such adages it is basically incorrect. The "bell" one should listen out for is when the market is out of line with its fundamental essence - the economy. https://research.stlouisfed.org/fred2/series/NAEXKP01AUQ661S# ) and calculated quarterly average 'All Ordinaries Index' (XAO) values from the adjusted daily close data (source: https://au.finance.yahoo.com/q/hp?s=%5EAORD&a=07&b=3&c=1984&d=08&e=28&f=2015&g=d ). 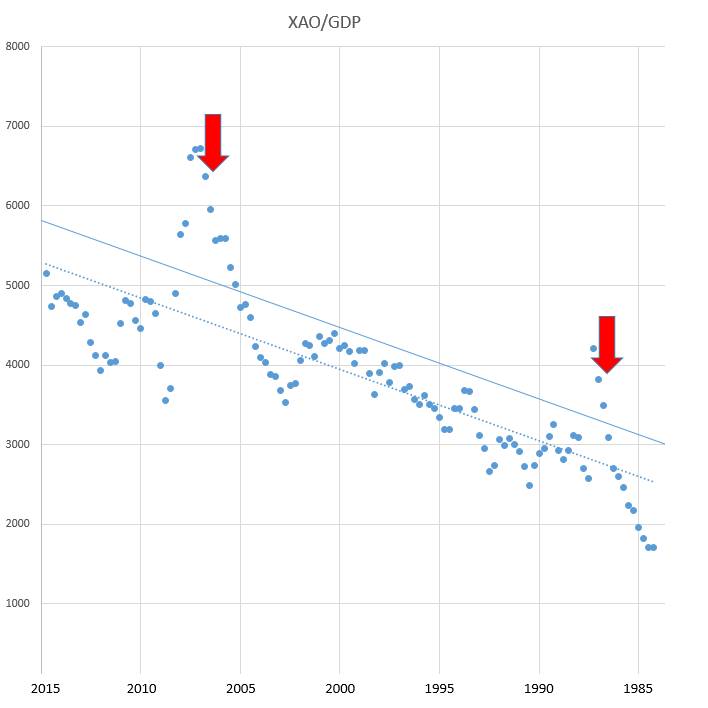 I've then simply divided the quarterly average XAO index by the GDP index to get a simple measure of the valuation of the stock market compared to the national economy. From this simple plot one can clearly see the two 'once in a lifetime' instances of 'irrational exuberance' (aka 'the madness of crowds') that occurred in 1987 and again in 2007. If one had got out of the market during the two quarters prior to each 'crash' where this overvaluation became apparent from this sort of simple plot, one would have done very well. (In my case I hadn't started investing in stocks back in 1987 -- I was just doing 'paper trades' as part of a Business Economics course at university, and in 2007 I decided to 'insure' my geared stock portfolio using Index Put Options rather than liquidate my stock investments and crystalize a capital gains tax liability, and then failed to 'roll over' my put options. The only difficulty with trying to take advantage of this clear signal is that when the market moves above the trend line it can do so for a considerable period, and by a substantial percentage, so while this plot will show when the market has moved into dangerous territory it can still be difficult to 'pull the trigger' and liquidate ones portfolio (or buy Put options) when the market appears to be in a strong up-trend. One strategy might be to sell off a fraction of the portfolio as soon as the market is clearly well above trend, and then sell off an additional fraction every month or two while the market continues to set new highs. Waiting for the market to peak and establish a clear down-trend is often impossible to implement due to the speed at which a market 'crash' can occur. While it may be tempting to also try and time Index Fund purchases by waiting for the price to drop below the trend line, the market tends to dip below trend more frequently, but with less severity, than the relatively rare instances when the market moves substantially above the trend line. For that reason it is probably sufficient to simply dollar-cost-average into the market (from example via an automatic savings plan being setup to buy a fixed dollar amount of Index Fund units each month) as long as the market is around or below the trend line. If the market drops considerably below the trend line due to global events that may only have a transitory impact it might be an opportunity to make an additional 'lump sum' investment utilizing any 'spare' cash reserves, or by deciding to increase gearing (however, if one already employs gearing, there is often little scope to borrow more when the market suffers a large drop -- one is more likely to be concerned about the possibility of a margin call).